Liv Bailey never forgot her high school crush. Champion roper Matt Montoya always did have that irresistible daredevil swagger. But Liv isn't Matt's shy tutor anymore. She's a grown woman and a physiotherapist with a painful past. Matt isn't the only tough one now, and when their tempers clash over a horse they both claim ownership of, sparks fly in more ways than one. Liv's willing to let Matt bring some passion into her life, but when he opens his heart to her, she's scared of being hurt again. 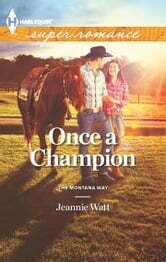 Liv knows there's more there than just desire-if she can only trust the cowboy who loves her.